Last edited by brian1961; 07-13-2017 at 12:04 PM. Gorgeous cards Brian. Do you have a close up of the Post Sheet? Sorry, Chris, no. The three stars on the '62 Post Cereal sheet are plain to see; nothing spectacular, aside from their pristine condition in the rough. I bought the sheet for the Roger Maris. If I chose to, the cards could come out top grade, but it's such a nice display piece just to enjoy it as is. I bought it at an antique mall in Rapid City, South Dakota in the late 90s. I'm sorry the pictures are not more close up. It took me awhile to stage it, but part of the reason was to spotlight my five-drawer blueprint case, of which I made reference to recently, that I fabricated into a display for some of my favorite cards. The items never see the light except when I open the drawers for a few minutes to admire them. The 1954 Stahl-Meyer Franks (covered in chapter 3 of my 478-page E-book on a CD, NEVER CHEAPER BY THE DOZEN) and the 1962 JELL-O unfolded boxes (from chapter 1) were only placed for the photo, then back to safer territory. Hope you, your growing family, and your new job are progressing very nicely. Last edited by brian1961; 07-15-2017 at 05:26 PM. Hello everyone, I just wanted to introduce myself. I just fount Net54 about a week ago and it has taken me that long to read every post in this thread! There is some cool stuff in here! A quick about me: Collected vintage cards as a kid, one at a time. Sold them all to a guy so I could buy a new Atari (stupid kid!). Got out of collecting in the 80's - hated the addition of Fleer, Donruss, UD, etc. Just recently regained an interest in cards again as I started to sell some of my other memorabilia (worked in Minor League Baseball from '97 - '04). Have been trying to be selective as my budget is small at this point. Mantle was my favorite player growing up even though I was born the year he retired and never saw him play. Read every book I could about him as a kid. Was fortunate to have some personal experiences with Willie Mays, so those two are my focus, but I've found more "bargains" in other stars from the 60's so far. I wish I had stuff from Mickey, but am fortunate to have gotten some cool stuff from Willie. Attached are the 2 Mantle's I've picked up. The '66 is in nice shape, but off-center a bit with soft corners. I'm thinking 3-ish if graded? The '65 is rough. I actually got my money back from ebay on it as it was listed as EX-MT. It has 2 significant creases and 2 indentations, I couldn't see from the pic. Looking forward to picking up a few along the way and see what others get. My favs and immediate goals are '56, '60 and a better '65. Welcome to the site, JenX34. My favorite thread ever. Never gets old. Have a few more things on the way and will post as they arrive. Thanks again and great eye candy in here. Last edited by mickey7mantle7; 07-12-2017 at 12:29 AM. Love the display idea. Might need to get one myself. That '56 is a beauty! David and patrick nice cards ! Graded is my preference, but every now and again I'll come across a raw card I just can't refuse. The price has to be to good with the chances of it being graded higher than what it was priced at. This was 80 bucks at a LCS. I figured it has a 6 potential and went for it. Last edited by mickey7mantle7; 07-16-2017 at 10:25 AM. A hearty welcome to the site. 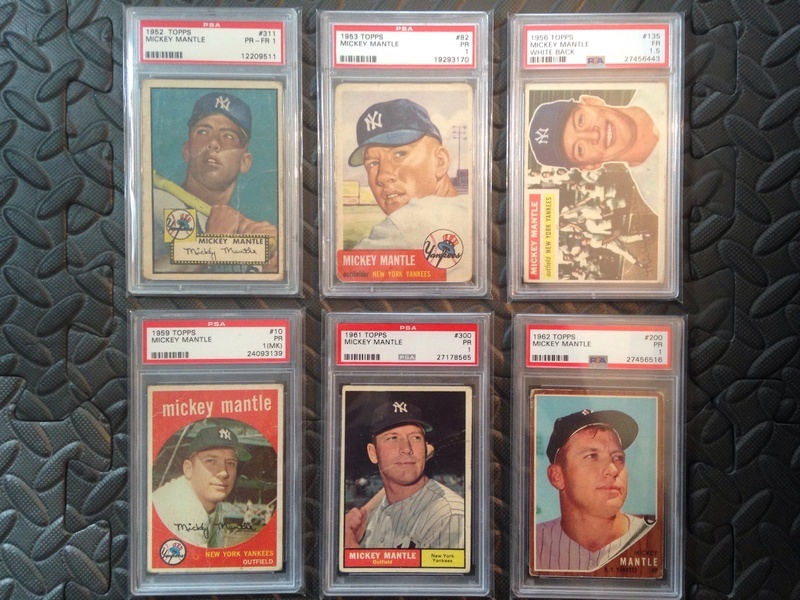 Thanks for posting your cool '65 & '66 Topps Mickeys. Here's wishing you the very best in your pursuit of The Commerce Comet and the Say Hey Kid. You've going for some good ones, mate. Try selecting a 1960 with the clearest photo and rich colors. Centering is important, of course, but my own is way off-centered, BUT has the crystal-clear photo and rich colors, so I am very happy with it. Of course, I bought mine in 1973 for the going price of the time. Anyway, I always enjoy seeing everybody's new Mantles, so when you strike GOLD, get on here for show and tell!!!!! For what it's worth, as you well remember, Atari was the rage for awhile, so don't feel too bad. My son never got into baseball or cards, but he fell in love with Sonic the Hedgehog! I never pressured him to try collecting bb cards; rather, my wife and I helped him build a top class Sonic collection that fills up about a third of his man cave. Last edited by brian1961; 07-15-2017 at 05:45 PM. Pretty good timing Brian. I just picked up this one tonight. Don't have it in hand yet. so all I have are the pics. Anyone care to guess how it would grade? Guesses welcome, I'm too new to be confident I'd be correct. Last edited by Jenx34; 07-16-2017 at 11:04 PM. I am guessing the card grades a 4. Others will chime in as well!!!! 3-4ish, but I see too many grades that make one shake their head. What caused that '58 to grade PSA 1? I've seen 3's that look worse, at least at first glance! I was in our local card shop today. I had a short list of a few "modern" cards I needed to take to the National for the included VIP autograph tickets. I asked to look at the 1962 Post cereal baseball box, and found this Mantle. Priced to sell at $10 I can't resist. A couple more non-card pickups. A serving tray from a Country Kitchen restaurant as well as a menu. In the group photo, I already had the menu on the left. I'm not sure when Country Kitchen became Country Cookin' or why. By the way, in case anyone is interested ... the Texas food staple, chicken fried steak, would have set you back $1.95 back then. Had to go back and look at some earlier posts. Nice Mantles all around. Brian, that is a very neat display idea. I might have to copy it. Michael, many thanks for your kind words. The SAFCO unit was from 1989, though I imagine they're still in business today. The five-drawer unit is very sturdy, made from heavy guage metal. The dimensions of the case overall is approx. 40 X 29". However, the actual usable display area is 37 X 18". The drawers will only pull out so far, so a lot of space is wasted; however, it was designed perfectly to house blueprints. As it was, there were flaps at the front of each drawer (installed to prevent the b/ps from curling) that I had to drill out to free up valuable display space for the cards. The pads I made really give the right effect of a personal museum display. In the end, what space remains is ample enough to offer some of my best a right proper spotlight viewing area, with full protection from all light, and preventing me from seeing them every time I walk in the room. Really, it's like five All-State glass display cases in one. Congrats, Mike, on your array of Mickey's Country Kitchen and Country Cookin' items. As Mick said, "To get a better piece of chicken, you'd have to be a rooster." I just wish it had been the "cash cow" Mickey had envisioned, or was convinced by someone else it would surely be. At least he finally found his gold mine, when he and Greer Johnson became a business, marketing the one thing thousands and thousands of collectors would gladly pay well for---his autograph. Have you been eyeing the Huggins and Scott auction of Bill Willen's massive Mickey Mantle collection? Mr. Willen also wrote a book, that just came out early this year, and from the looks of it, photograph-wise, it is perfect for the Mantle collector who'd enjoy a quality color photo of every Mantle card, coin, premium, and pack photo. For that alone, it is worth the $25 price tag from Amazon. I will need to buy a copy. It is also a paper book, so it's right up your alley. Mine's still available, but I'll shut up about that. Last edited by brian1961; 08-02-2017 at 12:43 PM. Brian, thanks for putting a name on the owner. That's a fantastic collection and right in my grade range. Someone messaged me thinking it might be mine, and looking through I thought some of the cards were mine. But, alas, he has the true rarities that will never show up in my collection. Chris, methinks you're selling yourself far short of the reality you truly have many of those same rarities that Bill owned, and is now selling. You have done very well. Mate, the story of how you acquired your 1960 Home Run Derby Mickey Mantle alone vaulted yourself into some pretty exclusive company. I've been putting together the 1958 Topps baseball set on/off for the past 20+ years. I recently got back in the hobby and really wasn't sure of a direction. Collect the remaining 1/3rd or focus on something else? Decided it was time for something new. Went to the National show with the intent of trading the '58 set and some other cards for a nice '56 Mantle. Had no idea that I would end up with this card but super pleased that after a long day of deals, I was able to bring home this 1954 Red Heart Mantle. Nice buy Larry. I had the only 5 of Clubs known for a while. Glad I sold it before these two surfaced. Awesome piece. You must be ecstatic about that pickup. Brian, thanks for the kind words regarding the Country Kitchen/Cookin' items. Also, thanks for the additional info regarding your "display" case. I was wondering if you found a blueprint case without the "flaps" at the front of each drawer. You solved that riddle for me. I have been eyeing the H&S auction of Willen's items. Chris gave me the heads up about it. I also saw a link in a thread somewhere here on Net54 to the clip on SCD with Willen. His book does look very interesting and since a hard copy is available (hint, hint), I will probably get it at some point. TIm, that Red Heart is a beauty. Very nice pick-up. Larry, congratulations on the difficult pick-up. Picked up a couple of the Mick today. Wow, I can't believe it's been a whole week since anyone has posted to this thread. Here are some pick-ups from the last week or two. Great stuff Mike! Love the tag. Nice to land a real one like that. Austin Mike---The only good thing going for that Journal-American is the more than decent photo of Mickey. It is unique, as I cannot recall seeing it on another issue. Really, in the SGC holder, the card presents very well. Nice going. You know, Mike, grading truly helps with the Journal-Americans because they're such flimsy cards. Being encapsulated gives the card excellent heft, and a much better all-around appearance. Obviously, a beautiful specimen. Back in the 1963, I peeled off those inserts and placed them on my bicycle. The rain didn't do much to them, but the sunlight killed them. Of course, they were already "dead" after I took the backing flaps off! I have this vague memory I did not stick Mickey to my bike; rather, I chose my bedroom wall. In the late 80s or early 90s, I bought another nice, fresh '63 Mantle peel-off sticker. As I reflect on it, I spent more replacing that sucker than I spent buying gum cards during all or most of my childhood! Then again, I remember a '61 Topps Mantle I saw that some kid shot with a bb gun. The hole was right above Mick's head. Worse, I bought a near set of the Yankees' 1967 Coca-Cola Premiums. This was around '93; the price was good--under a hundred bucks. It was plain to see what happened with them, or should I clarify, what was done to the Mickey Mantle. The group of nearly 12 had been placed together on a dealer's table at a show. They were bundled together with a large paper clip. Guess who had been on top? So, now the Mickey Mantle has a rather deep paper clip indentation on Mickey's cap. To top it all off, when the doofus removed the paper clip, that clip had a semi-sharp burr on it, as those clips often do. As the idiot removed the clip it tore a tiny bit of Mick's cap off! At least my other favorite card in the Yankee set, Mel Stottlemyre, came out beautifully. SGC graded it EX-MT, due to a tiny bit of corner wear. I used this card, and the Ernie Banks I had graded at the same time, to illustrate chapter 7 in my book. Those cards look magnificent in graded holders! Last edited by brian1961; 08-11-2017 at 12:49 PM. Just thought i would ask what you guys thought about this photo, what it might be worth and if the signature looks legit. To your collective Mantle expert eyes, tell me if the autograph is real. Thanks for the congrats on the glove tag. Brian, I remember back in '63 I kept my cards in a shoe box with some wrapped in rubber bands. Unfortunately, the cards I acquired back then have spent the last 49 years languishing in a dump somewhere in northern California (back then they were called dumps, now they're sanitary landfills - doubt those cards would be any more sanitary in a modern landfill than they are in that dump. ) If only we knew then what we know now. Chris, you might get a response if you place this question in the autograph section. 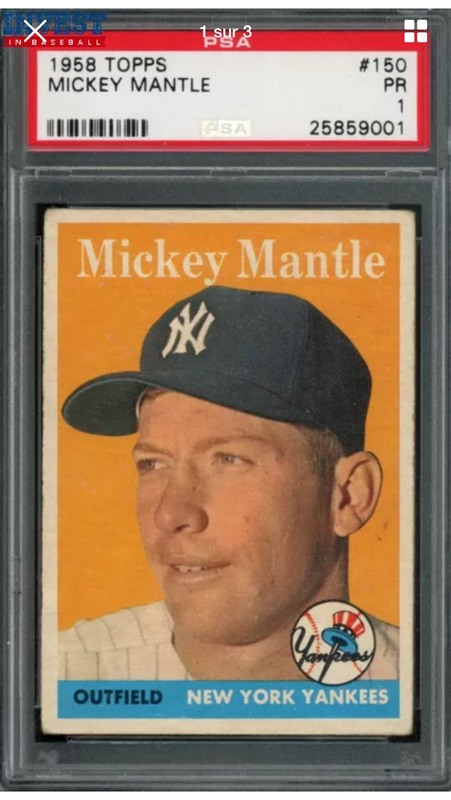 I know there have been many discussions about Mantle's autograph there and someone would probably be able to help you out regarding the legitimacy of the auto. Small PSA submission Mailday. Some oddball Mantles. Three highest graded. PSA doesn't recognize the colored site/black back as a variation but man that one was tough to find. Ben, yeah, I'm still looking for the colorized map with the black (versus green) inside. I've kept an eye out for it ever since you mentioned it in another thread a while back. Congrats on the oddballs. If the coaster was on eBay recently, I was one of the underbidders. Also need the mileage coaster. I got the Norwich Boy's Briefs bag because I had the Norwich Boy's Tee Shirt bag. Anyone know if there's a Norwich Boy's Sock bag? The bottle cap with "U8" is a Coke cap with a large head of Mantle. The bottle cap with the inside lining still in the cap is a Fresca cap with a large head of Mantle. Some great stuff in this thread. This is my best Mantle piece, a picture of Mickey Mantle on his first pro team, the semi-pro Whiz Kids, from 1947 when he was 16 years old. Mantle and a few of the other players have signed the picture (the other sigs are barely legible). The condition is a bit rough because it is an original that belonged to one of the kids in the picture, Guy Crow, who was the bat boy (left end of the right bench). Earlier this year, I finally was able to get this same autographed photo of Mickey. I had been wanting one ever since I saw the story of these in the pages of Sports Collectors Digest back in the 80s. The one I purchased on eBay had already been PSA / DNAed early this century. In case you aren't aware, photographer Ray Gallo was able to catch Mickey relaxed in the dugout at Fenway Park in September, 1956. The photo turned out perfect in every way. Mickey himself said it was HIS PERSONAL FAVORITE PHOTOGRAPH OF HIM. Around 1980, Mr. Gallo had a professional artist who worked with oils colorize the photo. She did the job of a master artist. Ray in turn had a decent number made into 8 X 10 prints, and then had Mickey autograph each one. You can tell your print is genuine from the personal Ray Gallo three-dimensional stamp pressed into the lower right-hand corner of the photo. Isn't it just dazzling, bro? For me, it was my first Mickey Mantle autograph. I display it with my cherished cards and coins of Mick, as well as Roger Maris.